"Brrrr!" "That doesn't sound like my idea of fun." "Why would anyone do that?!" "Have fun freezing to death." These are amongst the many remarks I hear when gearing up to head out on the water during the winter months here in Idaho. Why would anyone in their right mind go wading and traipsing through the snow when the thermometer reads somewhere between -10 to 30 degrees? Well, if done right, fly fishing in the winter can be a fantastic experience. Imagine the feeling of being snug and warm in your bed, but you are actually standing in the middle of a frigid river and everything is silent except for a small bubbling of water. Not another angler to be seen. Pure solitude. Just you, a rod, a river, fish, and peace and quiet. Just like we warm blooded land-dwellers eat on a regular basis, fish have to eat regularly too. Though, just like the conductor of an orchestra slowing the tempo of a previously rousing song, the symphony of life slows as temperatures drop. Fish will still chase food down, but as a general rule they will not go as far, nor as fast as in warmer times. Needless to say, winter fishing is worth it if done right. 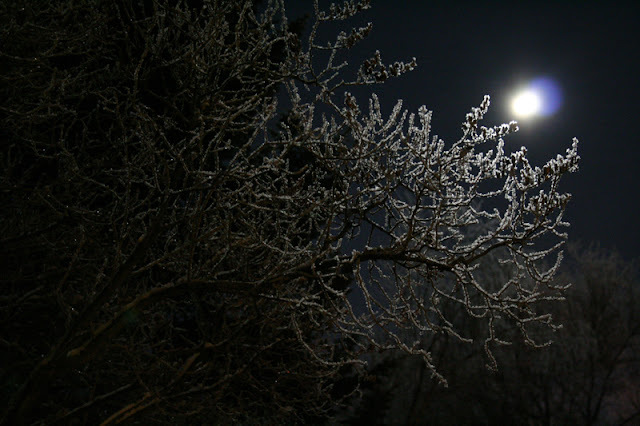 Stay Warm - This is perhaps the most important thing to keep in mind, and the most common deterrent. Correct layering of clothing is extremely important. The first layer (especially in socks) should be breathable and keep your skin dry. If you get damp from sweat and don't dry out quick your appendages will rapidly cool faster than they can warm. The next layer should be something that retains warmth. Wool is an excellent go to, or one of the awesome modern wool blends. Nothing should be too tight. If things are too tight, especially in the feet, blood circulation is restricted and warm blood cannot work its magic. Gloves are essential (at least if you are a scrawny guy like myself). Some guys prefer to fish without them. I think most guys wished they weren't necessary, but a good waterproof set of gloves can save the day and your fingers (just ask Brent about that one). These increase in importance because your hands are in constant contact with wet and frozen line. The scenario is not given to warmth. The importance is further emphasized when actually handling fish. I like to fish with at least my left hand wearing a fully waterproof glove because it is the hand I use for stripping line and releasing fish. I can reach into the water to hold the fish while de-hooking. This can also be beneficial to the fish on really cold days, since it protects their gills from freezing. I would rather remove my gloves to retie flies or untangle line and then return them to my dry gloves, as opposed to using those fingerless gloves that can let water in. Handwarmers are a great compliment to gloves. Toss one in each pocket for those particularly cold days. You can take a short break, warm the hands and get back to business. They also keep hands drier than blowing on them does. Keep Dry - This has already been eluded to, but is important enough to reiterate. Leaky waders are definitely something to avoid. If they leak and you know it, fix em. It will prolong the time you can comfortably/safely spend on the water. Keeping water out of your reel is also a must. Water in the reel means a frozen reel and all the sudden you find yourself Tenkara fishing. If you have had it happen before you know how maddening it can be. It is worth the extra attention and effort to keep this part of your gear dry. I have also learned recently that it is wise to remove water from magnetic net catches before reconnecting them. Take Your Time - The fish are moving slower, so why shouldn't we? Taking time to enjoy the view and sounds (or lack thereof) is both enjoyable and wise. Wade slower. One dunk in the river, however brief, will end your day and any bed-like sense of nirvana you have achieved in a hurry. If you are one that can't stand slowing down I suggest you take some dance lessons. That way when you start to stumble you can dazzle the fish with the fancy footwork. Sometimes gear acts differently in the cold. Line may coil, indicators slip, whole rod freezes over, and any other number of unforeseen things. Most fly gear is aimed at non-freezing temps. 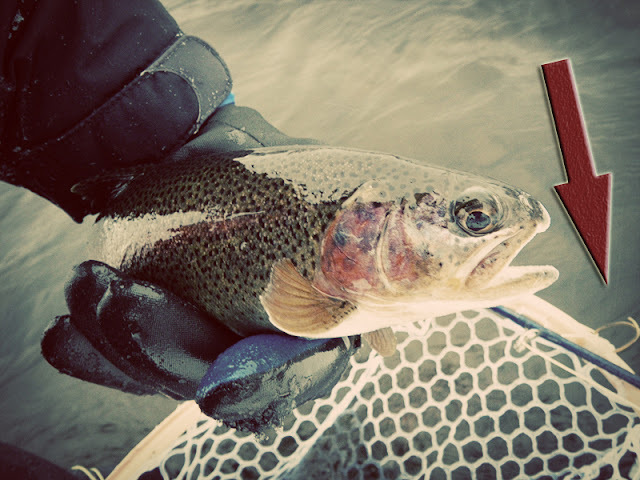 You can't blame the manufacturers, when the majority of anglers avoid cold rivers. Just realize this and adjust your game accordingly. 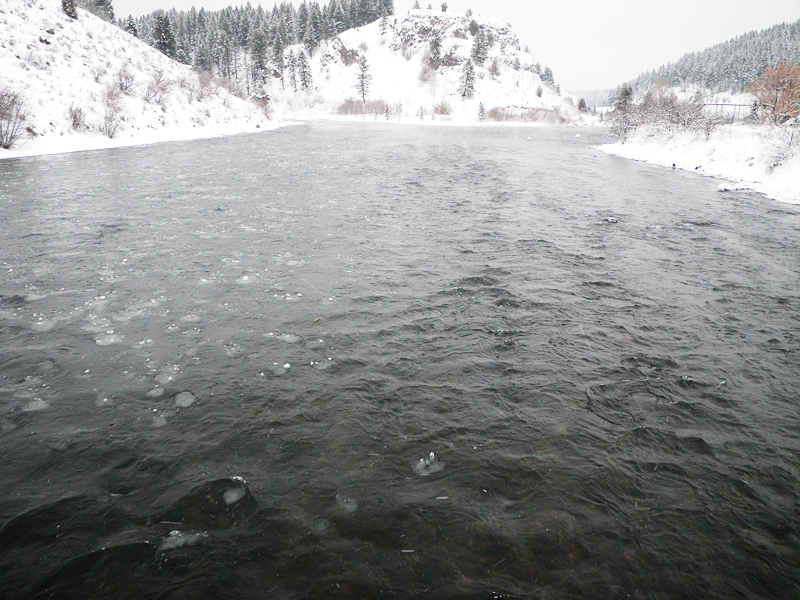 De-icing Guides - Ice forming in your guides is inevitable when fishing in the lower winter temps. This is another thing that keeps the fair-weather fishermen away. Some guys try to keep the ice to a minimum by putting chapstick on the guides. I'm not too sure how well it works since I haven't ever had the desire to try it. As for the removal of ice once it is on the rod, there are a few things that can be done. 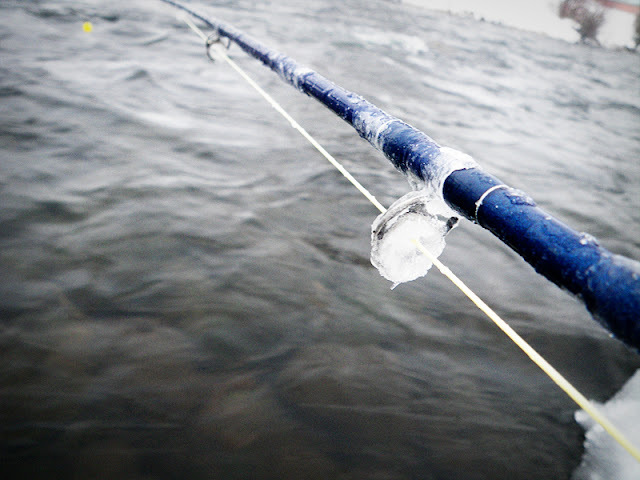 The first and easiest thing to do is hold your rod in the water and swish it around until the water removes the ice or loosens it enough that it can be broken out by hand. When dipping the rod in the water, extra care needs to be given to keep the reel dry. The next approach is to use your fingers to melt and break the ice out (take extra care around your rod tip). The last option is to place a guide in your mouth and melt the ice. Be sure to bring your favorite icee flavoring for this method. I would only suggest the third option in cleaner watersheds and care needs to be given for metal components around the guide (ever seen A Christmas Story?). The first option is the most preferable and the easiest, but sometimes the water is too cold to do much, then the second and third options are needed. Locating Fish - Think "easy food." Where will food/bugs rolling down the river be the most accessible, without requiring the fish to expend much energy. Deep pools, troughs, and drop-offs are good places to check. Pockets behind rocks and protected areas on the edge of shelf ice are not likely to disappoint either. Nymphing - During the cold of winter the thermocline flips in watersheds and the warm water is found at the bottom of the water column. The deeper the water, the warmer it will be, as odd as it sounds. Fish will hug the bottom of the river. Keeping in mind that trout do not move very far for their food when it is cold, and that they are practically sitting on the bottom, a nympher needs to run their flies along the bottom. If you aren't rolling the bottom, you won't be hooking up. This is often true concerning nymphing anytime of the year, but especially in the winter. Wintertime presents some of the best nymphing all year round. Fish just get hungrier as the winter deepens, and will take any little morsel offered to them on the food conveyor belt the river provides. 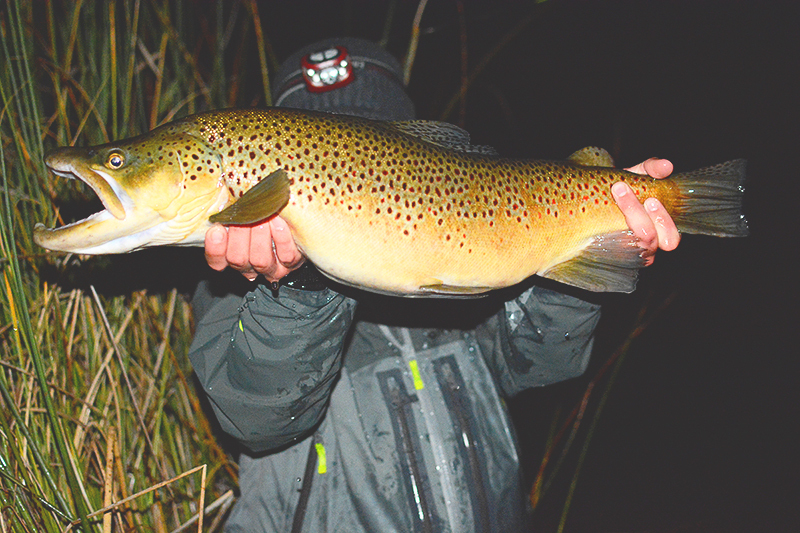 Streamers - A lot of anglers avoid streamers during the winter months. This is a shame and a loss for those who pass it up. 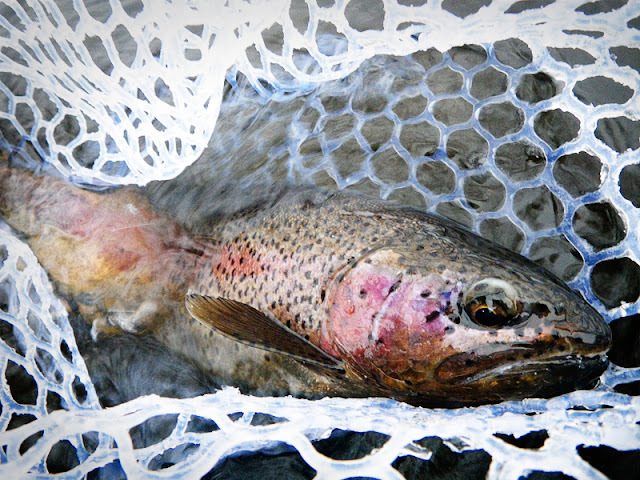 Get the fly deep and in front of their faces and you just might find some surprising results. Big fish don't entirely go into some hibernation mode. They are still feeding and will still take the opportunistic swipe at a big meal. It is a bit more of a trick during the winter because streamers need to be fished slooooow, so the weight needs to be enough to get you down, but not so much that it prevents you from a more relaxed retrieve. Sinking-tip streamer lines can come in handy in these situations, allowing you to fish a lighter fly. 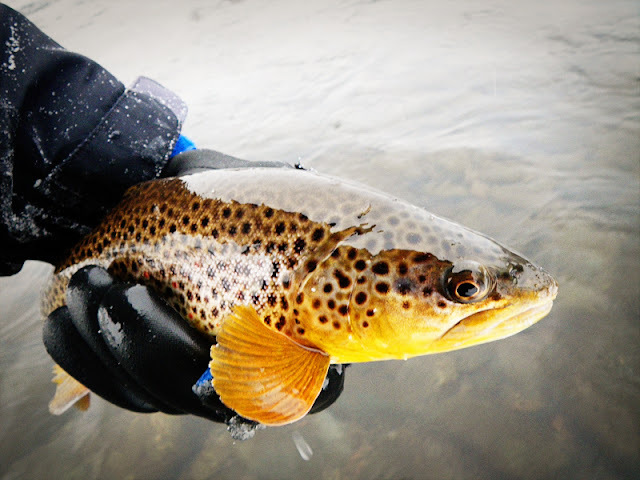 Dry Fly Midging - This isn't my first choice when winter fishing, but it can be extremely effective. Supple rods and small tippetts do the trick here. I like to use my 3wt BVK when chasing surface film sippers. Buddy System - It sounds a bit elementary but it is just good sense. When possible avoid going alone. A good fishing buddy may just save your life. You never know. And who else is going to push you out of a snowdrift when you get your car stuck... not that it has ever happened to me... well... maybe. Lastly, enjoy yourself. It is a time of year that presents some excellent fishing, and yet many people miss the magic of it all. Often times when you can get away from what the majority of fisherman are doing your experience can be spectacular. To catch the fish that most fishermen don't catch, you have to do the things that most fishermen don't do. I suppose night fishing on the fly in the winter would fit into that category... Not something I would suggest on most winter nights here in Idaho. It would be great to hear your thoughts, tips, and suggestions. What works for you? 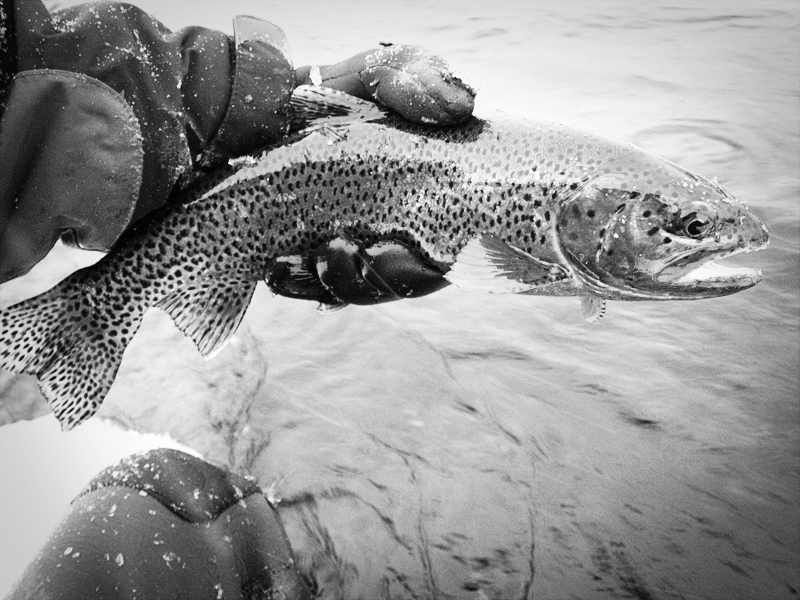 Brent over at Uprising also wrote up some great thoughts on winter fishing. Head on over and check them out too. The fish was now within nets reach, but to my surprise when I reached back to grab the net and gave a tug nothing happened. Nothing as in the net stayed right where it was. Well, what did I do... what most men do in those moments... I pulled harder. Apparently magnetic releases don't do so well in their releasing when everything outside is in insta-freeze mode. I ended up with a net in my hand, but the key ring that held it to the magnet was magnificently bend. I laughed, netted the fish, broke some more ice off my guides and kept fishing. It felt great to be back on the water. The magnetic release had gotten water in between and was frozen solid. This past month and a half has been crazy. I was under the impression that the three week break between semesters was going to be filled with family, fishing, and a general state of R&R. This was not to be. The very weekend after finals a nasty bug found my internals, thought it to be a cozy place, and set up shop. The kids and myself were all down for the two weeks leading up to Christmas. Fortunately the Mrs. and the baby escaped the nasty critter. Between homemade Christmas presents, family activities, and recovering there was not time or energy to do much else. Fishing is always the indicator of how sick I am. I usually ask myself, "would you still go fishing?" and if the answer is no then it is certain I am Ill.
After the craziness of the holidays settled down and we all were feeling close to 100% I decided to pack up the boys and go ice fishing. We went three times in one week, the last week of my break. The last trip we rolled up to the lake only to find the temperature on the van reading -18 degrees. It was cold and I kept asking myself what I was doing just after being so sick. It was fun, and I'm sure William appreciated getting out so much in one week. That kid is getting better at hooking fish all by himself. It can be a tricky business when the bite is light, but he has managed at least one on each outing. 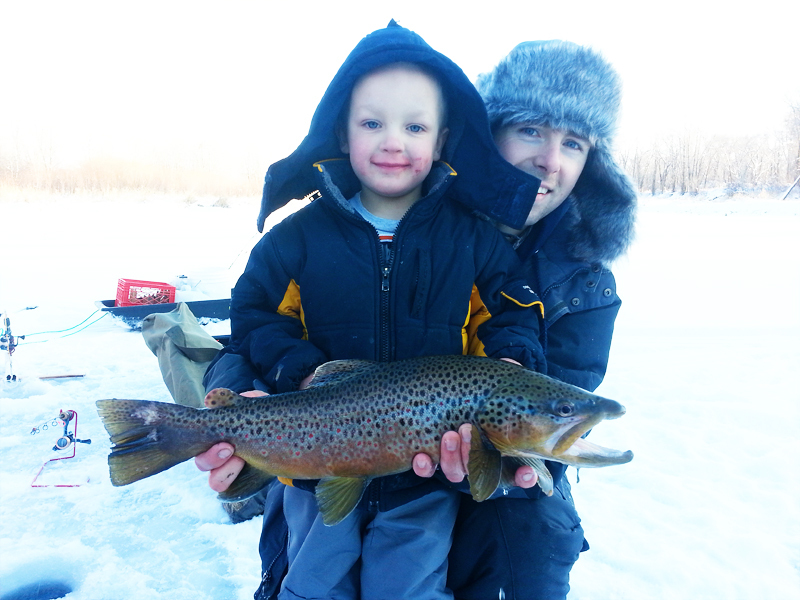 Will and I with a pretty brown we landed together, and with some great help from Shane. And now school has begun once more. Classes are back in full swing and the prospects to place a fly rod in my hand are oddly increased. Having a campus so close to so much good water is a fortunate thing indeed. And so it goes, toward the end of the first week I found myself, rod in hand, wading across a frigid river. As I navigated around small floating icebergs I thought to myself how wonderful it was to be out again. A month and a half had passed since a fly rod was in my hand. I think that is some new record for me. It was good. Family will always be the most important and I was able to get my head on straight again. With the priorities realigned though it felt fantastic to address the aching in my bones to be on the water. 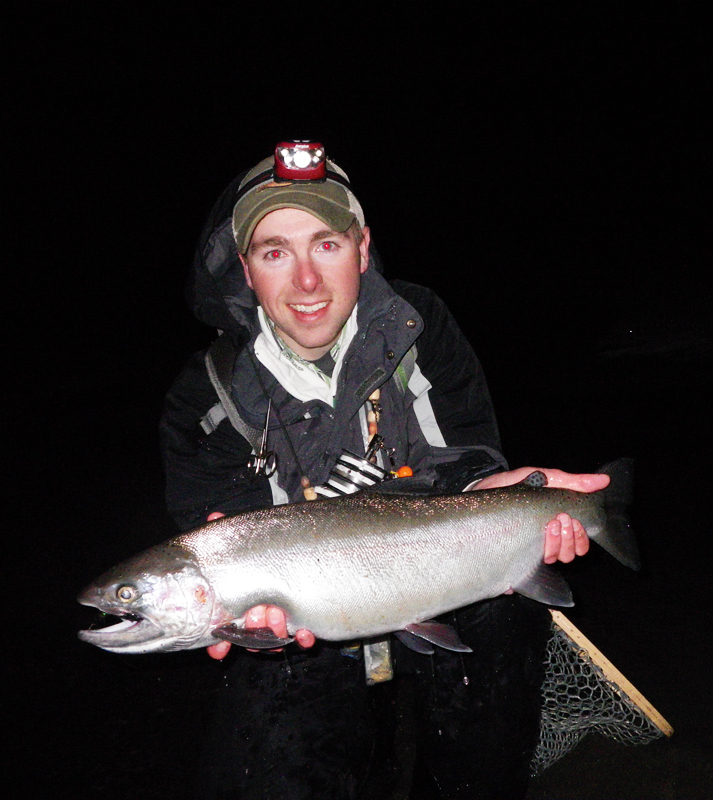 Guides, rod, reel, and fingers were all frozen, but I didn't care. 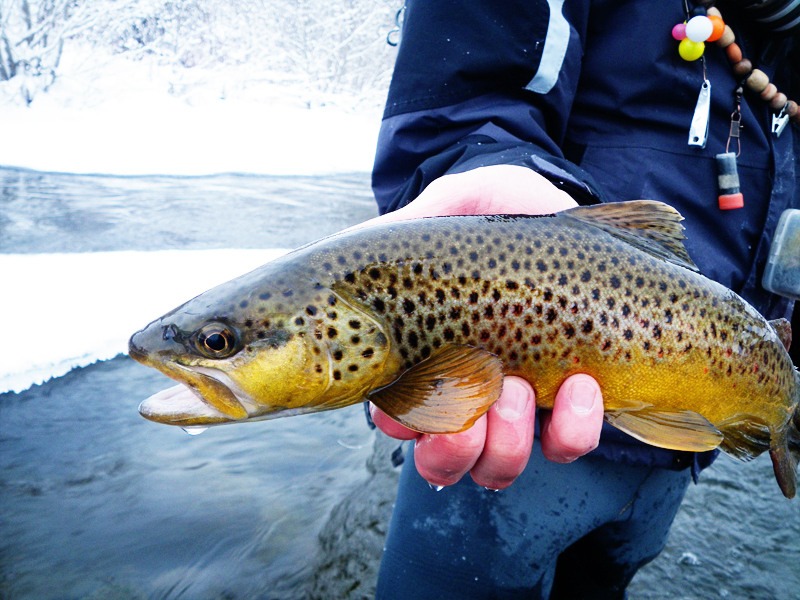 There is nothing quite like the bright colors of a winter trout on a silent winter day. 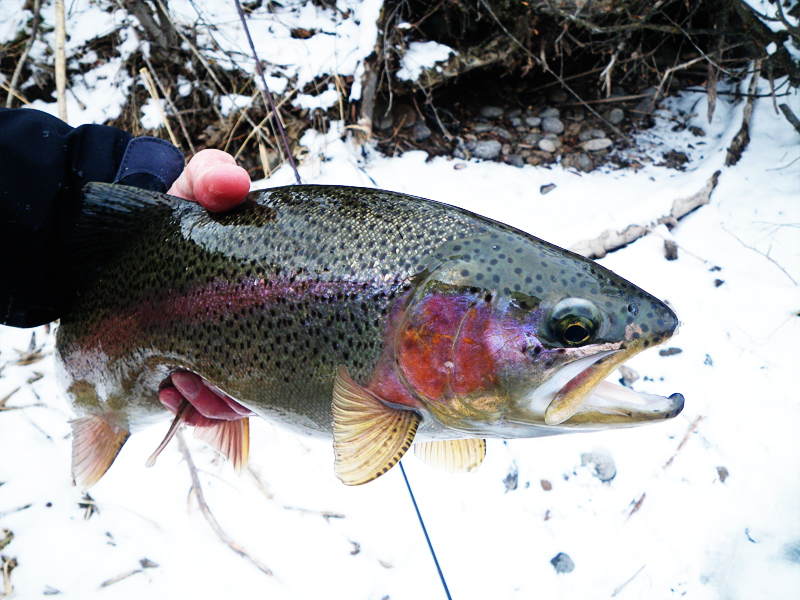 The snow kept falling, not another angler was seen, and the fishing was great. Cold and content sums it up well.